Here’s a recent Atlas Line trade. 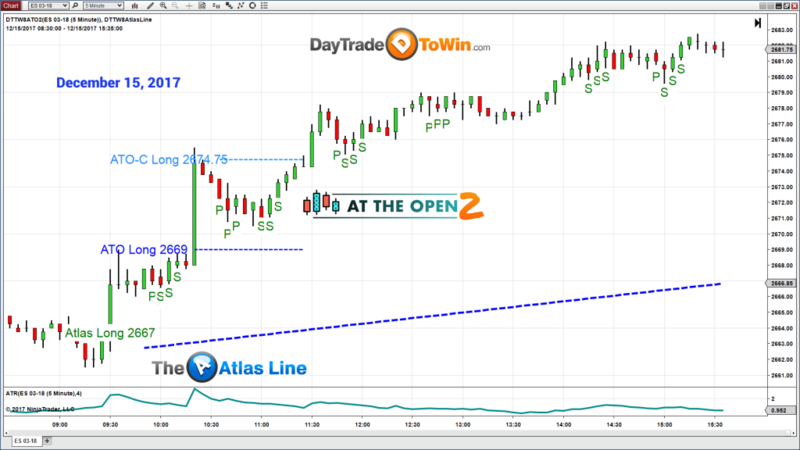 The Atlas Line is a day trading indicator that works with many different markets. The market being traded is the E-mini S&P March contract (03-18). The market has produced some great opportunities lately, despite some trading systems having difficulty with the chop. At around 10 a.m. on Jan. 29, the Atlas Line produced a short signal. Price was at 2869. The ATR was at 2.56. For the ATR, use a Period value of 4 and your ATR will look similar. An ATR of 2.56 translates to a profit potential of about +2.5 points, or +10 ticks. John Paul was able to enter the trade within about one tick of the entry price. The result was a winning trade. If you had been trading about five contracts, for example, your profit would have exceeded $500. Keep in mind, this is an estimate and there are no guarantees of accuracy with any trading system. Stay in a trade for as short a time as possible. Get in and get out. Limit the amount of risk your account is being exposed to. It’s not worth holding onto a trade for over an hour. In fact, the Atlas Line rules say 20 min. is the maximum. Day trading means exiting your position before the day is over. Check for news events early in the day. Yes, scheduled news events can cause significant volatility, turning a normally profitable trade on its head. If you know an announcement is about to be made, stay out until volatility subsides. Then reconsider entering again or waiting for another signal. Trading does not have to be black and white, win and loss. Think long-term success. Even per trade, it’s possible to get out at a smaller loss, smaller profit, or even breakeven. Here’s another example of how the ATO 2 and Atlas Line can be used together to find and confirm trades in the E-mini S&P. Many traders were expecting a bull market and were therefore looking for long (buying) trading opportunities. The ATO 2 and Atlas Line indicated the opposite, telling traders to go short with their automated signals. For example, the ATO 2’s short signal at 9:55 a.m. EST was based on the ATR (average true range). Take a look at the green line on the bottom. The profit target for the ATO 2 is usually over one point. Generally, you won’t see a profit target over four points. The same is true for the Atlas Line software. Remember, slower conditions cause lower profit targets and stop losses. Faster, volatile markets (unless too volatile) can be traded with larger profit targets and stop losses. When multiple trading systems confirm the same direction, John Paul believes the trade has more validity. This is especially usefull in a bull market where the common belief is price will trend upward. The Atlas Line’s 10:00 a.m. EST signal confirmed the ATO 2’s short direction. With only one trading system in place, you may be less confident with the trades you place. Live training is included with purchase for both systems. If you instead want to learn how to trade all of the DayTradeToWin.com methods, Mentorship is the best option. Each live training session is recorded. Play back each recording at your own pace. Lessons are truly live and are conducted entirely online. You attend a live webinar room where John Paul shares his charts and discusses his techniques. It’s one of the best ways to learn how to day trade. In this video, John Paul discusses the January Effect, which is a free trading method with simple rules. Basically, we’re waiting to see if the E-mini closes higher on January 31, 2018 than the opening price on January 2, 2018. If price does close higher, then the January Effect says that 2018 will be an “up year” overall. Because the year is expected to trend up, John Paul believes that it’s worthwhile to look for long (buy) trading opportunities after consecutive days of selling (bearish) activity. By using the Fibonacci tool, it’s possible to apply visual indicators that help determine the point of entry. Follow the steps in the video. Experiment with this free trading method in other markets. You may be surprised at what you find! Look for a minimum of three to four consecutive days of bearish activity. When price begins to surpass the 50% level on the way up, that’s your entry point. John Paul says that markets like to revisit levels they’ve previously reached. This is why the Fibonacii tool is configured to use a 100% level near the most recent high. Yes, conversely, you can use that for the bottom of the bearish trend. It’s really the 50% level that matters the most, and that will always be halfway. If you want to see how the ATO 2 and Atlas Line performed early in 2018, go to 22:40. Long signals were produced by both. These real-time signals were generated for everyone to see in the live webinar. Other DayTradeToWin clients should have seen the same signals. Occasionally, John Paul will take live trades in webinars. However, in this case, he was busy demonstrating the January Effect. When it comes to trading multiple signals, generally he advises taking whichever one appears first. The eight-week Mentorship Program teaches about 10 different strategies. These are far better than the free trading method options you’ve seen. He will teach you how to filter out potential losing trades and pick potential winners. The goal is to turn you into an independent, professional. With 2018 now here, we expect the E-mini to become more volatile with many opportunities ahead. Once January concludes, we will have an idea whether the January Effect will apply. We use the January Effect to help predict whether the entire year will trend upward overall. In the short-term, we are looking for more ATO 2, Atlas Line, and Trade Scalper trades for 2018 trading. In the following video, you will see how the ATO 2 and Atlas Line produces a couple of great signals despite slower market activity (that usually occurs during the final week of the year). The eight-week Mentorship Program is the best way to learn everything DayTradeToWin has to offer for 2018. The next class begins in a few short days. How was your E-mini trading on December 28, 2017? Because of the holidays, the market moved rather slowly. The ATR (Average True Range) was around 1.25 points. Despite this, the ATO 2 and Atlas Line produces great short signals. The ATO 2 signal appeared around 9:50 a.m. A few minutes later, the Atlas Line signal appeared. As discussed in other videos, when two trusted trading systems provide similar signals, John Paul gets excited. What signal do you take first? Whichever one appears first. Watch the video to see what happened in real-time with the second trade. No need to pick and choose trades as with other systems. Trade management is a large component of successful trading. The included live training and videos teach trade management rules that are specific to each method. Trade management allows you to potentially limit your risk and increase profits by adapting your approach so that it’s realistic. If the market is trading slow, it’s probably unwise to place a trade with a huge profit target. Likewise, a day that’s too volatile may not be worth trading at all, or if the volatility is decent, you may want to trade according to what the market can reasonably produce. We prefer this dynamic approach. John Paul believes that by observing price action, you can get a feel for what may be expected next. Remember that you can purchase the ATO 2, Atlas Line, and Trade Scalper separately. However, the best value comes from enrolling in Mentorship, where you are provided with over 10 unique strategies and concepts. DayTradeToWin also provides clients with free remote support for platform setup and software configuration. NinjaTrader is the recommended platform. If you’re operating with a tighter budget and want to trade with just one of our strategies, many students have found success with our ATO 2 course and software. About two signals per day are generated by the software. You learn how to manually find the trades yourself as well. In this chart, it was possible to win up to six ticks by following the rules. Note that broker fees and other potential trading costs are not accounted for. This six ticks comes out to $75 because each tick on the E-mini is worth $12.50. Traders like to potentially increase profits by trading with a larger number of contracts. For example, trading with two contracts may have resulted in $150. The amount of contracts you can trade depends on your broker and your account financing. 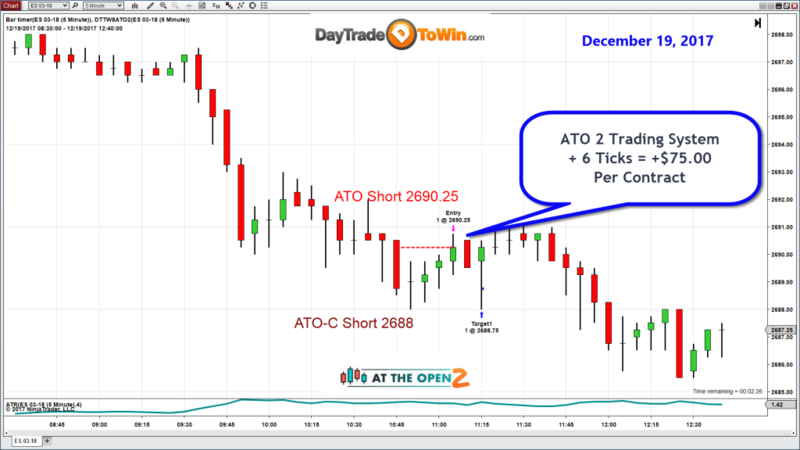 This ATO 2 trade probably made many traders nervous because price kept rising despite the short signal. That one candle hit the profit target and that’s all that was needed. Trending days are not that common, but when they arrive and two systems agree on the direction, John Paul gets excited. Notice that both systems provided long signals prior to large moves. 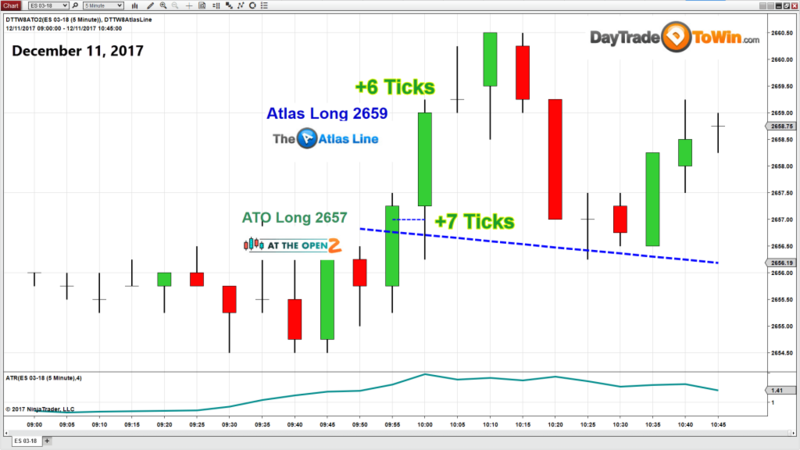 The Atlas Line’s signal occurred at the close of the 9:55 a.m. EST candle. Two ATO 2 trades followed: the first occurring around 10:15 a.m. and the second soon after. It looks like all three were winners. Large green or red candles are often the result of news events (planned or unplanned) swaying market direction. Generally, it’s best to avoid the known market-movers. If you happen to be in a trade when one occurs, John Paul recommends sticking to the rules. In total, it looks like there were three nice winners. Note the last trade is an ATO-C (Trade Chaser), taught in the ATO 2. So you’ve decided to try day trading to see what all the fuss is about. You’ve downloaded a trading platform (such as NinjaTrader) and you also signed up for live data. With a bit of reading and watching our NinjaTrader tutorials, you’ve learned the basics. After you’ve spent some time practicing, you start to see patterns in the market. After some time and simulated trading, your performance is not quite what you’ve hoped. At this point, you’ve begun to look for trading systems. There’s a lot out there. DayTradeToWin.com has stood the test of time, first offering the ATO strategy (now the ATO 2 is available), then the Atlas Line, Trade Scalper, and many others. Take a look at the picture below to see how the ATO 2 and Atlas Line work together. Yes, two days in a row is not enough to determine whether a system is consistently profitable. No trading system should make the claim of consistent profits because the market can always possibly head in a different direction. That’s why you have to consider there is always risk involved and do your homework. John Paul believes there’s a better chance price will move in the expected direction. John Paul believes that similar signals from two or more trading systems may be a better predictor of anticipated price movement. Coincidentally, both systems fired off signals around the same time despite each one using a different internal calculation. In total, it was possible to win up to +12 ticks. In the chart above, both trading methods agreed price would move up. That’s why the Atlas Line and ATO 2 produced long (buy) signals. In total, it was possible to win up to +17 ticks by following the rules. Of course, you have to factor in broker costs and whether you are trading multiple contracts (which would have increased profit potential). These signals are provided soon after the market opens. For example, 9:55 a.m. EST was the first trade. In addition to the obvious long signals, the small “S” symbols, green in color, present additional opportunities.